Editor’s Note: This is adapted from a profile originally published by NC State Study Abroad. 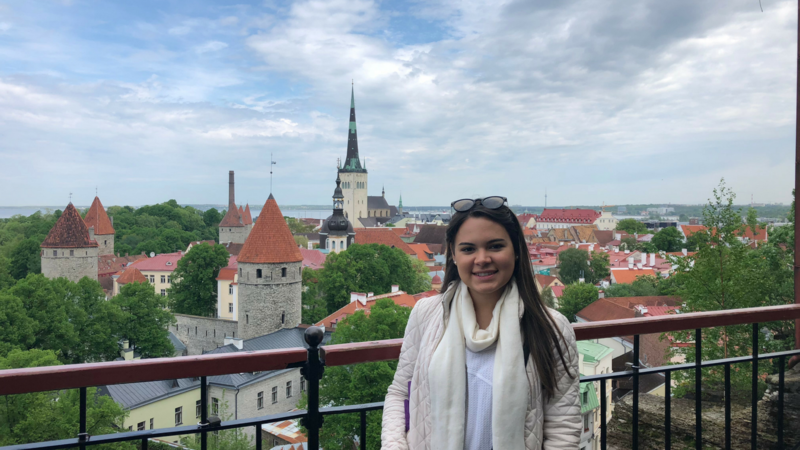 Claudia Rodriguez, a master of higher education administration student, talks about her experience with a new faculty-led research study abroad program in Finland and Estonia in the Q&A interview below. I wanted to study abroad because I am passionate about learning about other cultures and specifically learning about the education system in other cultures. I believe that there’s a lot to learn from other countries and their education systems and bring that back to prove what we are doing in the United States. Among the many things I learned about myself during this study abroad program, I learned that I am very independent and passionate about learning from others as well as interacting with people who are different from me. One of my favorite parts of the program was being able to experience typical Finnish culture with food, orienteering, and a Finnish sauna & lake experience. I would tell any future study abroad students to be as open-minded as possible and welcome any new adventures, unexpected interactions, and try as many new things as possible. One never knows what will come of the unexpected. Our study abroad experience was very non-traditional in the sense that we were not in the classroom taking lectures every day. Our class time consisted of us visiting a school for the day, talking to students and teachers about the education system and culture in both countries, meeting with scholars, and many other educational and cultural experiences in Finland and Estonia. We still had traditional classroom assignments such as blog posts and a final paper, however, the experience was much more hands-on/experiential which allowed us to learn in a much more effective and impactful way about the education system and culture in Finland and Estonia. I would do this again without a doubt. Anywhere I go, I try to connect with other Hispanic/Latinx in that country however it was particularly difficult in Finland and Estonia. I did not meet many Hispanic/Latinx individuals living in either country and quickly realized that the culture in both countries is vastly different from my Boricua culture. Although I had some research before on the culture of Finland and Estonia, it was still interesting to experience first hand the differences in the cultures and talk to natives about their culture. The vast differences in culture was a little difficult at first but I enjoyed learning about it. Research is the first step that I always do before going to another country. I want to know how my identity is going to affect my time in another country. As a Hispanic/Latinx woman, there are places and spaces where my identity is going to be more salient to me. There are countries where I’m going to fit in with everyone else and there are countries where I’m not going to fit it at all and I might face discrimination. Before I travel I want to know where I’m going and how to navigate those spaces. Part of researching is looking online but also connecting to people who have traveled to those countries and if possible with people who live or have lived in those countries. Their perspectives might be much more helpful than something you find online. My classmates and professors were a wonderful support when navigating any challenges faced abroad especially because we are usually facing this challenges together. However, my family and friends back home were also an incredible support system.